Abolish Wage Labor by 2027: Is such a movement possible? Communists must lead a fight to reduce hours of labor to zero in the next ten years; to completely abolish wage labor as an institution within a decade and realize full communism in North America and Europe by a date certain: 2027. This replacement would include the abolition of both money and the existing state. Is this possible? Am I demanding some utopian goal that cannot be realized in reality? There are several possible general objections to ending wage labor in ten years as I have outlined above. First, there is the objection that the the complete abolition of wage labor is not technically feasible. This objection, although powerful, flies in the face of all economic theory today. If abolition of wage labor is not technically feasible, why do capitalist states today devote trillions of dollars every year to promoting economic growth and full employment? Why is economic growth and job creation the central aim of all economic policy in every country on the planet today without exception? Absent this sustained and aggressive intervention by states wage labor would collapse right now. The state today is the only thing keeping wage labor viable as a means of producing material wealth and everyone knows this. Why then do we accept the idea that access to the means of consumption must remain dependent on wage labor? State economic policy is required today precisely because wage labor has outlived its usefulness as a means of producing material wealth. Second, there is the objection that the idea is not politically feasible. This would be a reasonable objection if we were running for office, but we are not. Why would communists care that abolition of wage labor is not politically feasible? Since we don’t care about holding office in the present state, why would we choose our positions based on what is politically popular at the ballot box. What is popular at the ballot box and what is necessary to end wage slavery are two distinct and separate issues. To give an analogy, if we based our positions on what is politically popular, black people would still be sitting in the back of buses. What possible objection is it that we can’t stand for complete abolition of wage labor because it doesn’t poll well? What communist in their right mind even makes this sort of argument? Third, there is the objection that a reduction of hours of labor will cause a massive economic crisis. This objection has more validity for us than the above two objections. A reduction of hours of labor would cause a massive economic crisis. But reducing of hours of labor causes a crisis in the economy because the economy at present is based on exploitation of the working class. Any measure that reduces the exploitation of the working class in an economy based on exploitation of the working class must throw the economy headlong into crisis. Let me argue that this is not our concern. We no more care about the fact that ending exploitation of the working class would throw the economy into a crisis than we should have been concerned in 1860 that end of slavery would throw agriculture in the American South into a protracted economic crisis. We are not the least bit concerned that businesses and governments will go bankrupt because they will be starved of profits and revenue. We are today, as in 1860, only concerned about the emancipation of the working class, whose material conditions will improve at the expense of both businesses and governments. Reducing hours of labor forces a massive shift in the distribution of the social product from capital and the state to the working class. This is not a bug. It is a feature. It is exactly what we are trying to do: to shift the social product from capital to the working class. For centuries that working class has taken the brunt of every crisis. This is our chance to force capital and the state to eat those costs. Fourth, there is the objection that even if technically and politically feasible, ten years is much too short a period of time. To the objection that ten years is too short a period of time to put an end to wage labor, my response is, “How do you know?” Can you cite a single study ever published that says the end of wage labor will take another 50 years? 100 years? 1000 years? Your gradualism is just another way of telling the working class not to demand an end to their exploitation under the guise of sympathy. The only reason for not demanding an immediate end to wage labor is a desire, more or less hidden, to see it remain in place. In my opinion, none of these objections to a movement to abolish wage labor by 2027 have a shred of validity. What about China and Japan? Why are you so eurocentric when the Japanese and now the Chinese have been the second strongest economies for half a century? Yes. My argument neglects China and Japan. Japan is an oversight that some might ascribe to eurocentrism. For this I apologize to my readers. I should have included that country as well. China is not an oversight, despite its strong performance. My reference to the countries mentioned is tied to their productivity, not their rate of growth. I have seen little evidence that China is bedeviled by the sort of surplus capital and surplus population of workers as is the case with the more advanced countries. Why the sudden faith that communism is possible as a political movement? Why don’t you have more blog commentators on this aspirational, up and at ’em attitude? Not a good start. I’m not sure I understand what you mean when you write of an economic crisis that, “this is not our concern”. Are you distinguishing between the ordinary citizen and the phantom communist who is able both to accelerate capitalism and immune to the consequences he will cause for himself ? Why is the communist not at least as terrified of an end of wage slavery as the working class worker? Stop changing your avi. They get worse with each iteration. This like Doctor Who. The show started out with the best Doctors and they got worse looking and greasier as they get younger through the Regenerations. I don’t entertain comments on my avi. As to the substance of your comment, first let me ask where you find any advocacy of a political movement in my argument? A direct action movement of the sort I recommend that challenges wage slavery should not be conflated with a political movement. Second, who is this mythical ‘ordinary citizen’ you identify who should be terrified by the end of wage slavery? Are you arguing that the working class should be terrified by the prospect that its access to the means of consumption is no longer premised on their supplying unpaid labor to the capitalist? This is a very interesting statement. Can you expand on it? Communists believe this occurs when a vanguard party seizes the government and governs benevolently, legally prohibiting exploitation of the workers and thereby destroying the profits and power of the ruling class. Jehu believes this occurs as an advanced technological economy renders labour superfluous. If black people are no longer at the back of the bus, it is only because it was politically feasible. Unless you have a different reading on the civil rights movement. How else does one abolish the state except through a political movement. Otherwise, the state will collapse when it is no longer even able to sustain control over production and wage labor. Your citation of Dr. King on the topic direct-action and demanding freedom from an oppressor who never surrenders it voluntarily, can not but be described as examples of political vanguard movement. your usual critique focuses on problematizing the welfare-state version of socialism sold by contemporary socialists and allies and on the technological change that is proving their strategies obsolete. I am interested in why you seem to suddenly be impatient that Corbynism or Sanders socialism is a kind of redirection of energies that could be better put to use ending labour entirely. When it is clear that there is no political solution, why are you only demanding political thinking from your fellow socialists out there, in la-la land, who never read Capital and like to go to marches demanding things. I have never heard this particular formulation before. Perhaps you can rephrase it. Anarchists are communists also. They believe nothing like this. Moreover many Marxists do not subscribe to the idea of a vanguard. Finally, even Leninists do not believe that a vanguard seizes the government and governs benevolently. You may want to find out what communists actually believe before you go criticizing my views. Your understanding of what is meant by the term ‘politically feasible’ is flawed. Certainly you will concede that the end of segregation could not have been obtained at the ballot box in 1957. The same is true for the abolition of wage slavery today. One abolishes the state through a direct action movement on the part of the working class to limit its hours of labor until the surplus value necessary to finance the state is no longer being produced. It was not a political movement. Rather, it was a classical example of a direct action movement by the working class to put an end to its servitude. Most notably, this took the form of hundreds of rebellions by the black working class in cities across the United States. I am not “suddenly” interested in criticizing SocDems. I have been following and critiquing them at least since SYRIZA became visible. Further, I am not demanding political thinking. I am instead demanding direct action from communists for the explicit purpose of putting an end to wage slavery by our own independent direct action. I WOULD find out what Marxists of all stripes believe but they refuse to say. They don’t want to make themselves politically or socially vulnerable to attack. Then if you press them on anything, they defend themselves with snark and ignore. The terror comes from the the fact that labour sharing agreements may not occur on a mutual basis. The end of wage slavery, as you put it, will only give rise to further losses of privileges, however small. Your utopian anarchy will not in fact come to pass. What will be instead will be a more atomized economy, only possible due to the major products being machine produced without any labour. These chains are comparatively comfortable. The working class, who are not class conscious communists, will not even know where to begin asking for a reduction in hours. The bourgeois middle class intellectuals who identify as communists, will lose their privileges without a slave class to provide cheap services that are not easily automated. This leaves only the working class communists, who can not organize their fellow workers because their fellow workers refuse to imagine less labour rather than more money as a desirable goal. The quality of life at work also matters to how much you are willing to work less, if it means less money to consume. Less than half of all jobs, by a cursory estimation, could be called working class jobs. The other half are quite pleasant to the people who have them. And even within harder blue collar jobs, there is a certain inspiring excitement at work, the work that they do. It is a place of social interaction and adventure. The only people with a motivation towards a direct action like a general strike, would be demanding less hours from a majority of society who wishes the work week were even longer. I found a resource that might help the movement achieve its aims. It is called “The Secret” and it is a powerful self-help method based on the law of attraction (positive thinking attracts positive outcomes). There is also a 2006 book. Really, you are doing yourself no favors with these silly comments. The more you explain yourself, the more pessimistic I become. Free time will eliminate surplus capital created by industrial scale productivity increases and thus eliminate wars of adventure by the capitalists. Free time which can only be created as THE PROLES seize it. Good luck with that. All those PROLES working the factory lines at Ford Motor Company will save our free time! I guess the industrial revolution HAS been a disaster for the human race, as some weirdo wrote. On a recent post, you included a photograph of a sit-in protest. 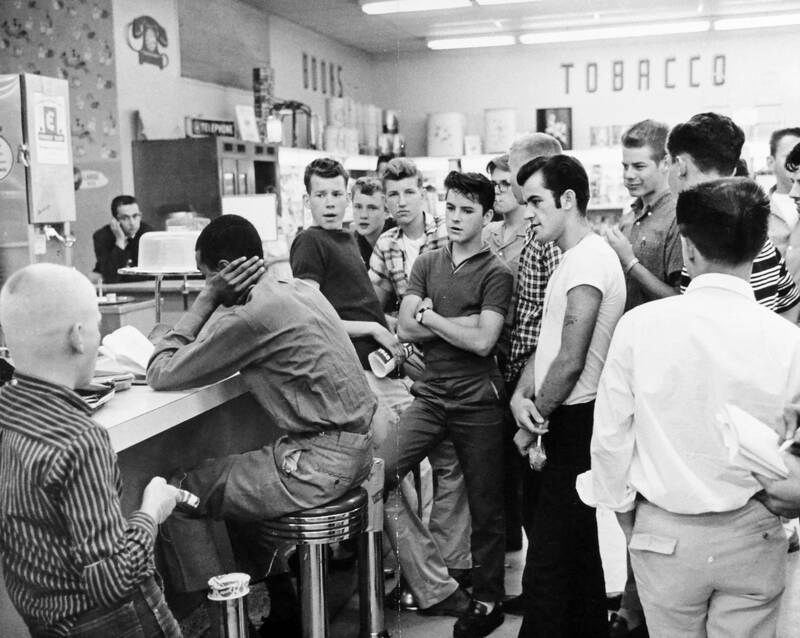 I was fascinated because all of the young white men threatening the protester looked just like I remember older kids in my neighborhood around 1960. I tracked down a collection of sit-in photos and discovered that the protest at hand had taken place in Arlington, Virginia–just outside DC. It had been initiated by students at Howard. I learned that the white counter-protesters had been organized by Rockwell’s American Nazi Party. You can see him in another one of the photos. Diamond spoke at one sit-in commemoration (see youtube video). Apparently, he lives in DC and is a financial advisor. On a more serious note, I also found an analysis of the campaign to desegregate an amusement park in a Maryland suburb that teases out some of the early tensions between liberals and black activists. Hope you find it as interesting as I did. This is just to add some further period context of the period to the excellent resources on Don Diamond and Stokely Carmichael poste by John above. These are two videos of John Lewis (THE current house rep) at the March on Washington and Selma.